Down below I have posted all of the possible outcomes based on head to head tiebreakers. I had a good time running this and I hope everyone else had fun playing. We will try and be more flexible with rescheduling in the next tournament and Hielco is joining us in the Spring Fling that is not in the spring anymore. When this is over let me know if you want payment in GC code from Amazon or a Paypal transfer. I am not going to bother with the trophies. I would send you VISA gift cards, but the US Federal Gov't has made this virtually impossible. I could buy a 40.00 trophy and to send it to The Netherlands it would cost an additional 30.00 S&H. No telling what it would cost to send to Greece. Now you can spend the GC on whatever you like. BEM HCS 6 6 6 6 1 1 6 32 I want to commend BEM as his match with Monje came down to the last day. Queenbee1 1 6 1 1 1 1 1 12 I am not eligible as the host of the tournament and it would be pretty silly giving myself an award. The drawing will take place when the tournament is completed. I made a mistake with Round one in giving Pasxalistz 6 points when he lost to Unladen Swallow. Edited by queenbee1, 22 May 2017 - 09:05 PM. Edited by queenbee1, 29 April 2017 - 12:57 AM. Comments have there own page now. Edited by queenbee1, 02 May 2017 - 06:44 PM. Edited by queenbee1, 26 April 2017 - 08:06 AM. Edited by queenbee1, 29 April 2017 - 11:22 PM. Edited by queenbee1, 02 May 2017 - 06:45 PM. Deleted as the cumulative page is above now. Edited by queenbee1, 17 May 2017 - 06:05 PM. Edited by queenbee1, 08 May 2017 - 11:13 PM. To clarify the final 8 seeds 1 and 2 of each suit will play each other to get to the final four. If there is a tie for 2nd place there will be a playoff between #2 and #3 to play #1 seed. Edited by queenbee1, 01 May 2017 - 04:40 AM. Unladen Swallow, this is a wonderful contribution to the tournament! 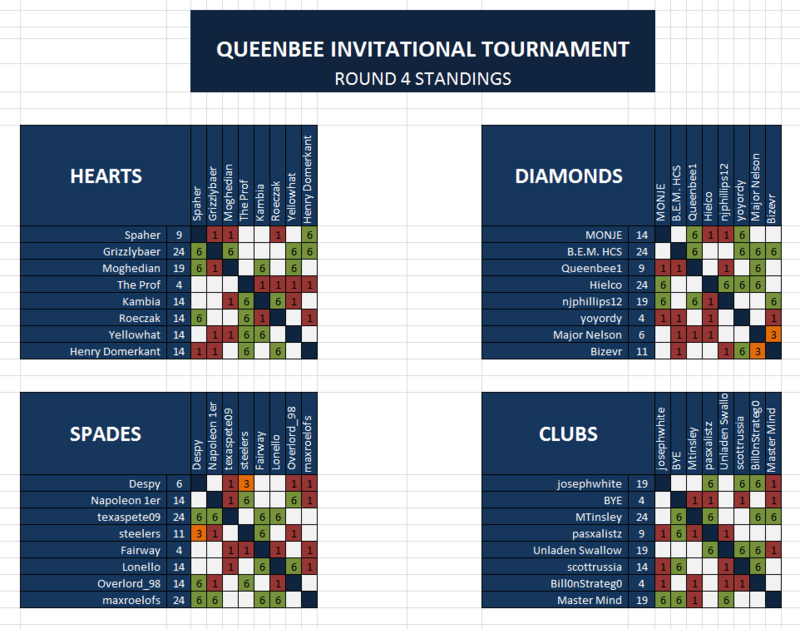 I know that I speak for all of the tournament committee when I say thank you very much, and to all of our participants, your spirit and commitment are essential to the fun and success of the QueenBee1 Invitational! I ditto that ! It's nice. You should join TC or something! Here here for the Unladen Swallow. Since the Spring Tournament is cancelled and we have players who want to play I am offering another tournaments starting at the end of round 7. Show me support and I will run the tournament again, but I am not going to give away money this time. I think that should be a once a year thing at best. So tell me do you all want another tournament? I have sent out invites to all of you and if I get enough interest I will invite the others who couldn't make the QB Invitational. I'll call it QB's Spring Fling. You can reply to me directly. If we get enough players I will create a sign up page asap to let others in. Edited by queenbee1, 05 May 2017 - 12:00 AM. I think it would be more practical to use the head to head result between 2 and 3 as the tiebreaker instead of a playoff. Could this be done? I agree. That's how it's done in TC tournaments. Edited by Unladen Swallow, 08 May 2017 - 07:24 PM. I misread the thought from Unladen Swallow from above. Edited by queenbee1, 15 May 2017 - 02:10 AM. I'd also like to advise everyone that Master Mind has been added to my advisory board. This means that he will be asked to weigh in on situations and decisions that have to be made as we continue to grow. We feel honored to have you. I am certain that you will be able to help us as the Queenbee brand grows. It's all about enthusiasm. So it's 5 members now?